The U.S. Air Force is planning to spend nearly $200 million on special glasses and visors to protect pilots’ eyes from dangerous lasers like the ones the Pentagon accuses China of firing into the cockpits of U.S. warplanes. The Pentagon said the equipment is needed to protect aircrews from “emerging laser threats” in a contract announcement late last month. A laser shined into a cockpit can distract and potentially blind a pilot. The new devices “shall provide protection sufficient to prevent permanent eye damage and protection against the temporary effects of laser weapons/devices,” a May contracting document states. Two companies — Gentex and Teledyne Scientific & Imaging — received $98.3 million deals to deliver the new eye protection through 2024. The new glasses and visors must work with pilots’ current helmets. The contracts came less than five months after U.S. officials accused China of firing military-grade lasers into cockpits of American aircraft. 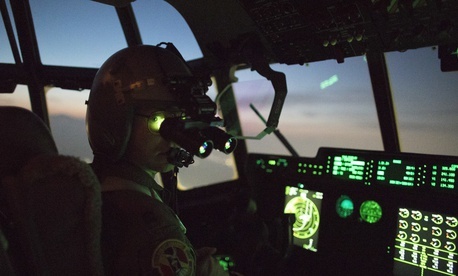 Two American C-130 pilots reportedly suffered minor eye injuries during one incident. Pentagon spokeswoman Dana White said in May that the United States. filed a complaint with China, which denies it was behind the incident over Djibouti. The U.S. and China have separate bases in the African nation. The American base, Camp Lemonnier, is a hub for special operations forces, counterterrorism, and intelligence-gathering missions in the Horn of Africa and the Middle East. In June, the Pentagon said its pilots were being targeted repeatedly by Chinese lasers as planes flew over disputed islands in the Pacific. Each year, commercial pilots report thousands of incidents involving readily available laser pointers being shined into the cockpit. In the United States, shining a laser at an aircraft is a federal crime.